Our daughter lucked out with a couple of pretty awesome sweets to celebrate her birthday with this year, both delightfully chocolate. The Chocolate French Silk Pie with Salted Pecan Crust was her special request, and earned the highest ranking from all of us. And we cut big slices of this fantastic Oreo Surprise-Inside Cake for an early celebration to include family who wouldn’t be around on her birthday. The cake recipe comes from the new book from Amanda Rettke of i am baker, and it’s scrumptious and so much fun! I stayed up late one night assembling this cake, to give it ample time to chill overnight so we could slice it up the following day. When Hatti opened up the refrigerator the following morning, her eyes got huge as 5o-cent pieces as she gasped out loud and asked, “Is that MY birthday cake? !” She was so excited to have one of Amanda’s cakes made for her, after admiring all of Amanda’s incredible creations online. This cake is just too much fun. It’s like a giant Oreo that’s stuffed with Oreos! 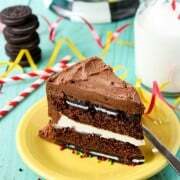 Every element of this cake is wonderful, but just like Oreos, we all had to agree that the thick slab of Oreo filling (could we just call this Double Stuf?!) running through the middle was the very best part. It’s thick and creamy and wonderfully flavored. Not that I didn’t eat my fair share of that creamy chocolate buttercream as I was assembling the cake. I canNOT resist chocolate buttercream or Oreos. This was one yummy cake that made all of us happy. Have you gotten your copy of Amanda’s new book yet?! After being amazed by Amanda’s creations at her online home i am baker for so many years, it’s so wonderful to see her in print with Surprise-Inside Cakes. A personal friend of mine, Amanda never ceases to amaze and inspire me with her baked creations. She is one insanely gifted woman. This Oreo cake was my first attempt at one of Amanda’s surprise-inside cakes. And it won’t be my last. It was fun to make, fun to present to eager eaters, and even more fun to dig my own fork into. Fun, fun, FUN!!! 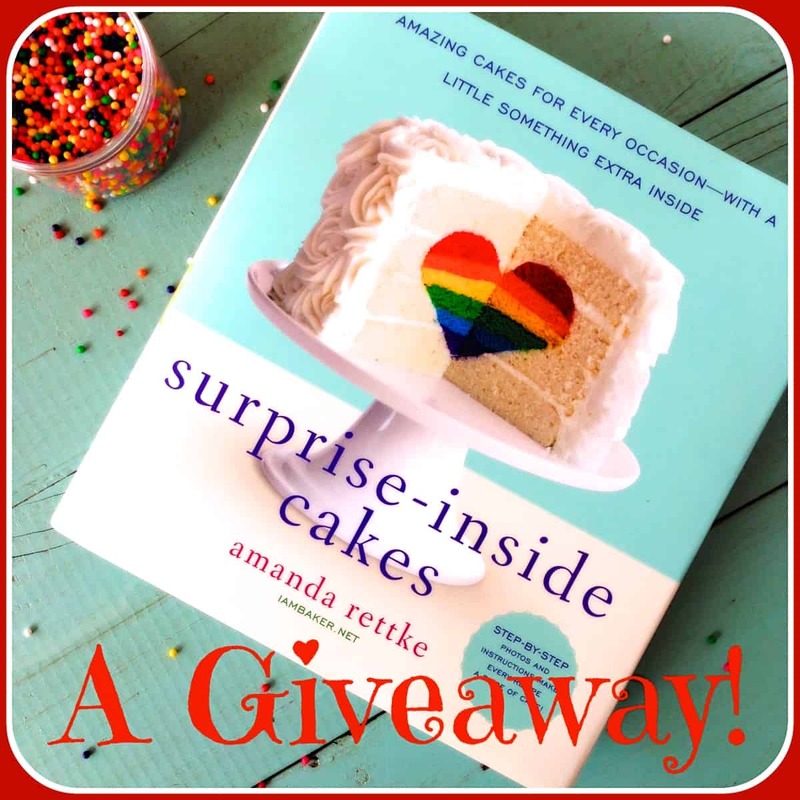 Would you like to win your own copy of Surprise-Inside Cakes?! Set a rack in the center of the oven. Preheat oven to 350°. Spray two 9″ round cake pans with non-stick cooking spray and then lay 19 Oreos in an even layer on the bottom of each pan. Set pans aside. In the bowl of a stand mixer, using a paddle attachment, blend the cocoa, sugar, cake flour, baking soda, and salt on a low speed for 30 seconds. Add eggs, sour cream, and vanilla and mix for 1 minute on medium-low speed. Remove bowl from the mixer. 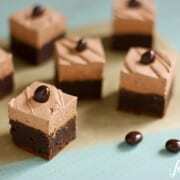 In a small bowl, whisk together hot coffee and chocolate until chocolate is fully melted. Add coffee/chocolate mixture to the stand mixer bowl and stir by hand with a spatula until all ingredients are fully incorporated. Divide batter evenly between the two prepared pans, covering the Oreos completely. Bake for 25 to 32 minutes, or until toothpick inserted into the center comes out clean. Remove pans from oven and let cool on a wire rack for 10 minutes. Run a knife around the outer edge of each pan and carefully remove cakes from their pans, setting them on wire racks until they cool to room temperature. In the bowl of a stand mixer, using the paddle attachment, mix butter and shortening until fully combined. Add the sugar, one cup at a time, alternating with the milk and vanilla. 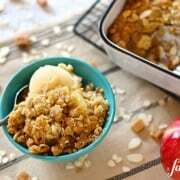 The filling should be very thick, but you can add more milk if you need to thin it a bit. In the bowl of a stand mixer, using a paddle attachment, cream the butter, cocoa, and vanilla at medium speed for 1 to 2 minutes. Add the powdered sugar one cup at a time, adding in milk whenever the frosting gets too stiff or the mixer starts to struggle. After the last of the powdered sugar has been added, add the rest of the milk and mix until the frosting is smooth and silky, about 2 minutes. 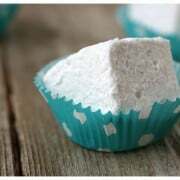 For a stiffer consistency, add more powdered sugar, 1/4 cup at a time. If the frosting is too stiff, add in more milk, 1 tablespoon at a time. I made a larger batch of chocolate buttercream and used a different technique to finish the cake than Amanda did (she covered hers in Oreo cookie crumbs), and would recommend adding just a little more milk to make the buttercream easier to work with in creating a finished frosted look. Place one cooled layer on a cake stand or large platter, Oreo cookie side down. Using an offset spatula, cover the top with the Oreo filling, in an even layer. Top with the remaining layer of cake, Oreo cookie side up. Then frost the sides and top with the chocolate buttercream. You may or may not use all the chocolate buttercream, depending on your preference for frosting quantity. If you want the same look as in my photos, I used all but about 3/4 cup of the frosting. I also added a wide tube of frosting around the base of the cake using a large plain pastry tip, and then sprinkled the base with colorful sprinkles. The buttercream sets up pretty quickly, so add the sprinkles as soon as you get done with the frosting. Amanda recommends freezing her finished cakes for at least 6 hours before serving, to ensure ease of slicing and preservation of the surprise-inside designs. Then use a sharp knife, dipped in a tall glass of hot water and dried, to cut your slices. Dip and dry the knife after each cut. Enjoy!! Adapted slightly (I added more chocolate buttercream and finished the outside of the cake differently) from Amanda Rettke’s new book, Surprise-Inside Cakes. Amazing! Planning on making this cake this week. Can it be frozen for a day or more or will that compromise the taste? I love anything Oreo so this cake is definitely up my alley. What a great birthday cake! 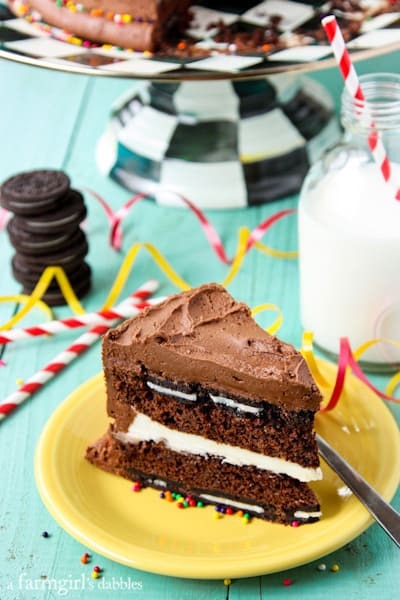 Who wouldn’t love a cake with a delicious surprise inside, especially when it’s Oreos! This cake is gorgeous! I love that cake plate–so unique. Your daughter is one lucky lady. Thank you, Jennie! That cake plate is a favorite, from Mackenzie-Childs. OREO CAKE? Oh heck. I would just eat the whole thing myself. I can’t wait to see Amanda’s new book! Your talent leaves me in awe! What a beautiful cake! Perfect for a birthday! What a gorgeous cake! 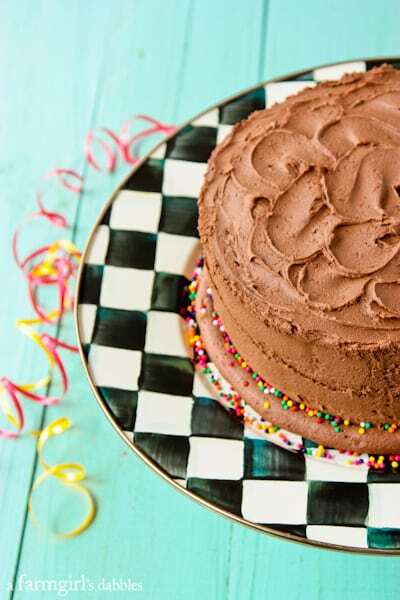 I love that you added more chocolate buttercream to the cake. I bet your birthday girl loved her cake(s). My husbands birthday is in April and this recipe has his name on it. I know he’ll love it. I know I will!! Who wouldn’t be thrilled to have this for their birthday cake?? Looks amazingly decadent and delicious Brenda! Oreos are THE only store bought cookies I will eat. To have a filling and a cookie layer—-totally decadent. But ya know when its your birthday, decadence should flourish and flow. Ha! BTW, your cake you made looks AWESOME Brenda!!!! Stunning! Love the oreo in this cake!! Oh my this cake looks divine–I would have been so excited to have this for my birthday, too! Mmm this is totally my kind of cake – so pretty! Be still my oreo lovin heart! 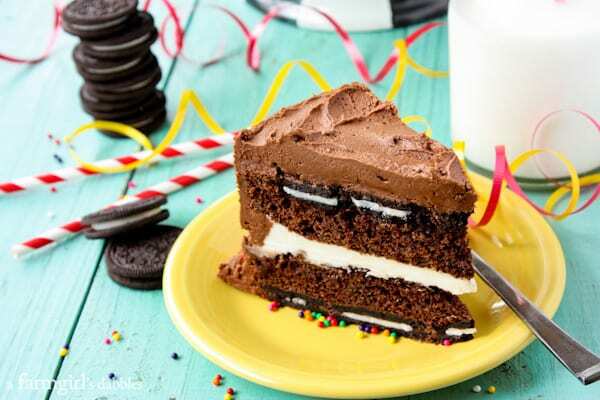 This cake is any oreo lover’s dream! Amanda is amazing, and you baked a beautiful cake. Happy Bday to your daughter too! This cake could not be any better! My family would love it and I need to get my hands on this book. All the reviews are simply amazing!